Who would have thought that potatoes were not considered to be a food during the 17th century? Yes, the French have deemed these crops only as a hog feed. But thanks to Sir Antoine-Augustin Parmentier, his studies and stunts have proved that potato is indeed edible. Sir Pamentier featured potatoes by hosting dinners and serving all sorts of potato dishes. To make it more enticing, he had his potato patch watched by armed guards to indicate how valuable they were. He then instructed his men to accept bribes from the crowd and withdraw in the evening so that those greedy people would try to ‘steal’ the potatoes. Not only that, his studies on potatoes have saved a lot of people from famine. 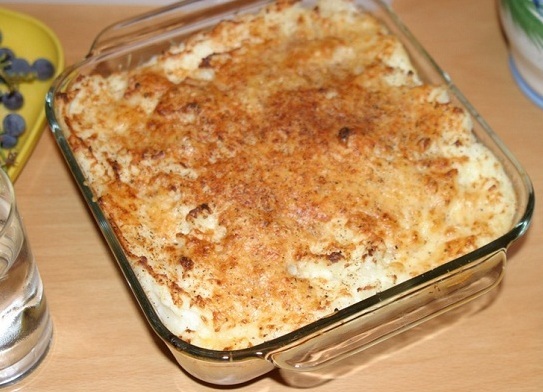 That is why, hachis parmentier, my dish for today is named after him. 1. First, sauté the onions and the garlic in melted butter till the onions are tender. 2. Then, add the tomatoes, ground beef, floor, salt, pepper and herbs. Cook them for 5-8 minutes till the meat is well done. 3. Add the egg yolk and parmesan. Mix well. 4. Spread the meat mixture in a flat bottom pan. I recommend using a 10×10 Pyrex pan. • Boil potatoes for 30-40 minutes. • Peel the potatoes and mash them. 6. Mix in the cream, butter and milk till you get the consistency you like. 7. Spread the mashed potatoes evenly over the meat. 8. Spread the grated cheese on top and bake for 15 minutes at 350. 9. Add salt and pepper to taste, and a touch of ground nutmeg. 10. Cook for 5 minutes in the broiler.